We offer a 16, and 32 GB SD cards for use in our all inclusive DVR hidden cameras. For continuous recording, you may want to have an extra one so you can switch out the one you're using with a new one and continue to capture the video. That way, your surveillance system isn't down while you check and transfer video files to your computer. 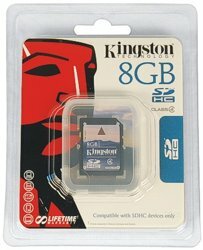 Memory card used to store high-quality digital still shots and video camera recordings. Can be used in any of our hidden cameras with built-in DVR. Having a nanny cam with an SD card has the advantage of not needing anything else at all to record your hidden video. The SD card records all the video onto itself so you don't need any extra cable or a receiver in order to pick up the video signal. The video is recorded internally.